Wild Child? Lavender & Chamomile infused organic olive oil calms, induces sleep, and allows sweet dreams. Made especially for babies and children but stressed, sleepless adults love it too! This blend was created for our owner's child who had colic as a baby. Try it on cradle cap, rashes, and burns. 4 oz. bottle w/ pump top. Click here to try sample. 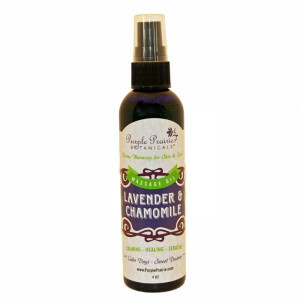 Aromatherapy Benefits: Calming, Healing, Sedative. Directions: Use medicinally for massage, in bath water, or after shower for soothed nourished skin. 100% Natural Ingredients: Organic chamomilla recutita (chamomile), infused organic olea europaea (olive) fruit oil, organic helianthus annuus (sunflower) oil, lavandula angustifolia (lavender) essential oil, chamomilla recutita (chamomile) extract and tocopherol (vitamin E).